Black is known as New York's color of choice - and it basically is but we like color too (I especially love a standout color). Whether it's full on color or a sliver, we're all for it. 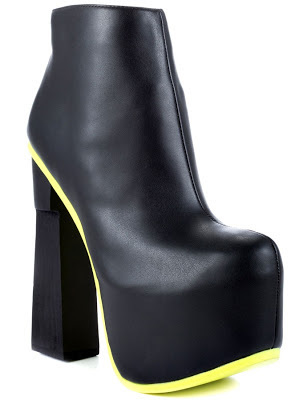 Take for example the above smooth and very mod Dolce Vita Yasmine Boot, it's black leather upper, mod 6 1/2" block heel (which so reminds me of a chess piece) and concealed 2 1/2" platform is brought to life by the pop of bold and bright yellow on the soles. If it was all black, would it catch your eye as much? I think it's the shock of color that makes this baby stand out. What do you ladies think?